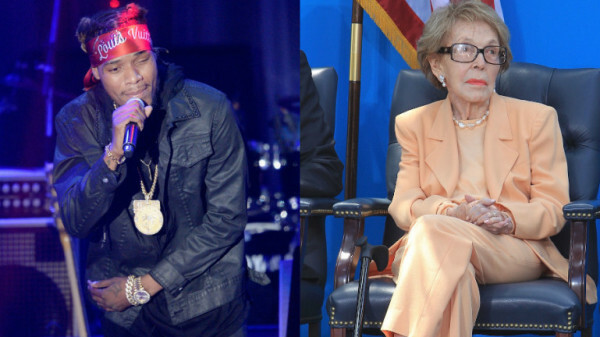 *Just days after the death of former First Lady Nancy Reagan, a new petition has surfaced on Change.org to have Fetty Wap perform his hit “Trap Queen” at her funeral. Reagan died Sunday (Mar. 6) of congestive heart failure. She was 94. So what’s the motivation behind the effort? According to Vibe, the petition referenced the crack epidemic that plagued America during the presidency of Reagan’s husband, Ronald Reagan. It was during this time that Nancy Reagan’s Just Say No” campaign emerged, an effort the petition’s creator says resulted in the current “school-to-prison” situation. “Did President Ronald Reagan permit the sale of tons of cocaine into the American inner city during the height of the crack crisis? did he turn a blind eye to the Iran-Contra affair’s web of gun-running, terror support and narcotrafficking. Did he facilitate a problem and then let his wife get famous with a simple solution “Just Say No?? ?” Was Nancy Reagan the OG Trap Queen??? I don’t know I’m just relaxing until the Lakers and Warriors game comes on but ummmmm Rest In Peace….,” Charlamagne wrote. To read the petition in its entirety, click here.